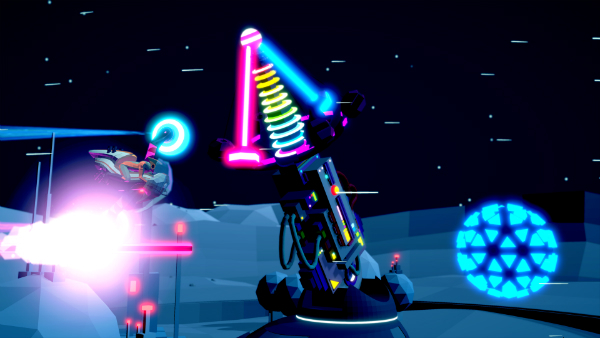 In Future Grind, you play a racer who defies death on a daily basis by racing something that looks like a bike of various shapes and sizes across a variety of tracks by matching his/her color coded wheels to color coded rails. There is a bit of a story the game tries to tell but it’s silly and doesn’t offer much as it seems to be more of an after thought on the developers part. You get recruited by various teams to race on their tracks but there’s something more sinister afoot and it’s up to you find out through text messages given to you from one of your handlers before each major race. You basically keep racing and getting access to new bikes and stages but it feels poorly handled and ham-fisted at best. Needless to say, if the game’s game play can’t keep you hooked, then it’s non-existent “story” won’t be of much help to you either. Unlike it’s nonsensical narrative, the game play is where the game shines. Much like the game “Trials”, the objective in Future Grind is to make it to the end of the track unscathed. That means balancing your weight as you leap from rail to rail making sure you’re connecting with the correct color of the rail lest you explode. Starting out, I honestly thought Future Grind was a little too simple but I quickly realized that the beginning of the game was basically like riding a bike with the training wheels on. By advancing to new stages you’ll eventually unlock new bikes and the levels only get more complicated. One bike for instance is like a big, fat bucket with a wheel attached to the side of it and another wheel that juts out from the top. Managing it’s weight was much more difficult which made navigating it’s races much more harrowing and exciting. Future Grind’s tracks might be small but each new track attempts to introduce something new. From bouncing orbs to tracks that will forcibly change the color of your bikes tires, you’re bound to crash over and over again. Each track also comes with it’s own set of objectives that are unlocked after you’ve completed the initial race. They might request the player do a specific trick or build up a high enough combo multiplier by the time you’ve reached the finish line. While the requests get a little repetitive, they also tend to get a little more complicated. For instance, there was one that asked me to do a golden 540 back flip on a track where I needed to turn both tires gold and avoid any purple rails in between. It wasn’t easy to do and finally landing the trick and making it to the finish line was extremely satisfying. While the tracks are well crafted, there isn’t much else toward the design of the game. The neon colors of the rails and your wheels provide a stark contrast to the games flat environments that have little detail put into them. It’s obvious that Future Grind features a more sci-fi setting but it’s environments and soundtrack often clash. The EDM soundtrack while fun and fitting for the action, it doesn’t exactly jive well with the dimly lit city you race above in the middle of the night of the island setting you often find yourself grinding through. It never feels like a place where EDM is necessary which ultimately takes away from Future Grind’s and the track’s setting. Despite it’s ham-fisted narrative and confusing setting, Future Grind achieves exactly what it set out to do. 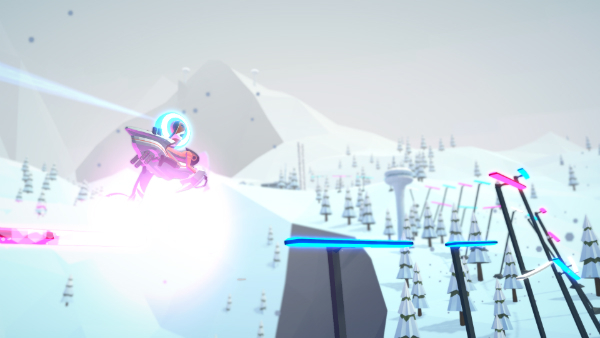 It provides an exciting and fun twist on the “Trials” platformer racing game play. It’s frustratingly challenging but fun and rewarding with a soundtrack that will keep you bobbing your head to the beat as you continuously press repeat after each and every crash.